Live broadcast! It’s 1850, and Europe’s most feared terrorist is hiding in Dean Street, Soho. Broke and restless, the 32-year-old revolutionary is a frothing combination of intellectual brilliance, invective, satiric wit, and emotional illiteracy. As he is circled by creditors, spies, rivals, and prospective seducers of his beautiful wife, his only hope is a job on the railway. 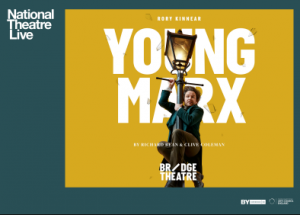 Rory Kinnear (The Threepenny Opera) is Marx in this rollicking new comedy, which reunites the creative team behind the hit One Man, Two Guvnors.